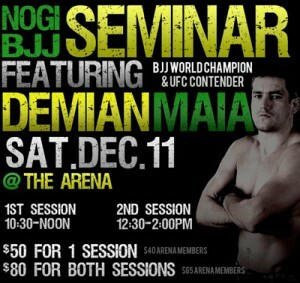 Great news for Brazilian Jiu Jitsu enthusiasts and fighters in San Diego area: BJJ World Champion, ADCC Champion and UFC Contender Demian Maia will be holding a No-Gi BJJ seminar at The Arena MMA. Each session will last 1 hour and 30 minutes, with the 1st session starting at 10:30am and the 2nd session starting at 12:30pm. Demian will be available after each session to answer questions, sign autographs, and take photos.